As you’ve probably already read, I’m kind of a fan of Pinterest. Being that DIY is such a hot category (and I’m a DIY pinning addict) I’m going to do a quick roundup of my favorites (that I will do – when i get a moment to breathe – i swear). 😉 I should mention that I like to tweak DIYs to give them my own personal style, so I’ve shared the links to the original DIY and included some of my notes / tips below each photo. If you’ve done any of these or have any favorite projects, please share and comment with any tips, links or pics. In the meantime, Happy Friday and I hope this inspires you to get your hands creating this weekend. Studded collar via Atlantic-Pacific (project inspired via Cheetah is the New Black). You can pick up these pyramid studs online at Studs & Spikes or at M&J Trimming here in New York (not available via their online site). Just make sure you dab a bit of Fray Check around the edges of each hole to prevent the fabric unraveling/studs falling out. Okay, this isn’t really a DIY but I’m digging around to try and find some ombre how-to instructions for at least a few of these (stay tuned). For now, I will say the petals on the cake are pretty self-explanatory (+ pretty beautious, right?) and can probably be picked up at your local silk florist, Michaels or Hobby Lobby. *Thanks to Decor8 for posting. For those of us that haven’t fully purged our closet of that favorite too short sweater <<slowly raises hand>>, this DIY is for you. *Disclaimer: I may try this out first on a Goodwill find before taking my scissors to that pink cashmere. I know, I’m a being a baby. Puff paint? 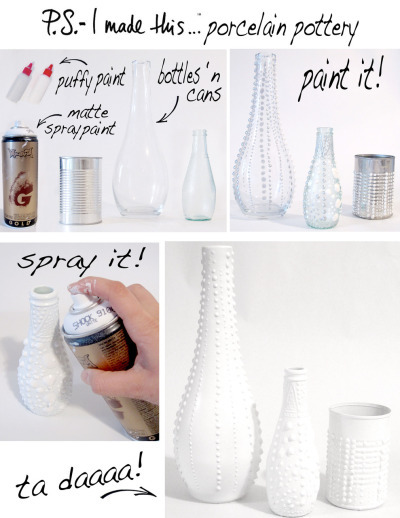 Spray paint? Redesigning? Amazingness. Who needs Jonathan Adler now? Thank you PS – I Made This. 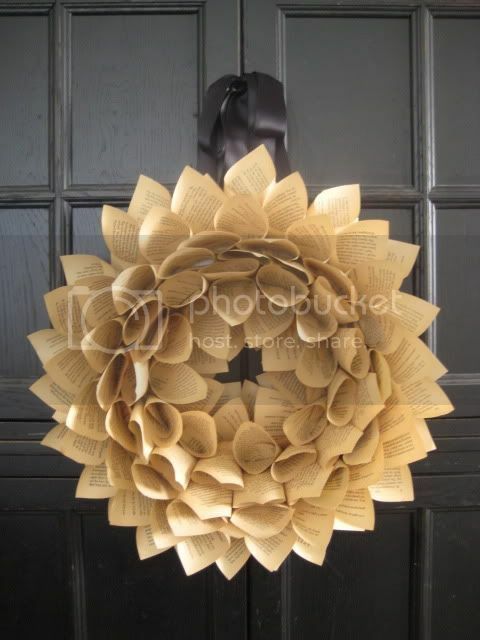 Even though I don’t decorate in this style, I absolutely loooove this DIY. The instructions can be found here. Make sure to scroll down and read all the add’l tips as it seems this DIY has been a little tricky for some. *I’d like to modernize this somehow…maybe spray paint the doilies with metallic paint to make them look like metal embroidery? Add some small chandelier crystals dangling randomly throughout the interior? Do a cluster of sizes but in the spirit of the bubble lamp? Hmmmmmm…thoughts??? While we all would like to afford beautiful, handcrafted furniture, the reality is IKEA will often have to do for now. 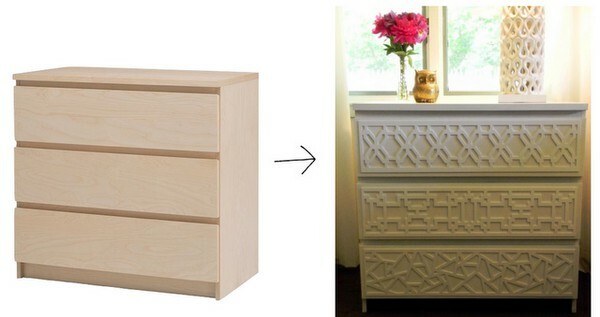 Fortunately, there’s IKEA hacks, such as this that make designing your own unique piece of furniture inexpensive and easy. This entry was posted in DIY, Fashion, Handmade, Interior Design and tagged book wreath, DIY, DIY dresser, DIY porcelain pottery, DIY wreath, doily chandelier, doily lamp, IKEA hacks, matte paint DIY, matte paint jars, matte paint vases, ombre, ombre cake, Pinterest, Pinterest DIY, Pintervention, studded collar, upcycling vases on March 2, 2012 by Stacy.